TeamStrap Moving Straps will change the way you move. TeamStrap moving straps make furniture moving easier & safer! Designed by professional movers, TeamStrap carrying straps reduce strain on your body and give you greater control while carrying appliances and furniture. TeamStrap makes it easy to move appliances through doors, hallways and even up and down stairs. "We bought these moving straps to move a washer/dryer onto a trailer. It was easy to figure out how to use these straps (even with two different sizes people). Lifting the washer was a breeze! I highly recommend it!" 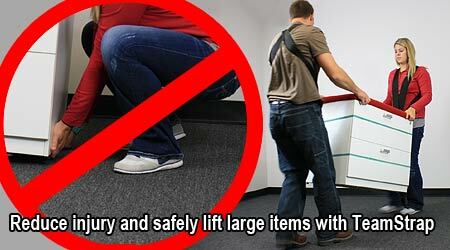 Avoid Injuring Your Back When Carrying Furniture or Appliances. Use TeamStrap Appliance Carrying Straps. TeamStrap ® carrying straps are a patent-pending innovation in lifting. The two-man adjustable carrying strap is capable of lifting up to 650 lbs. With the average household refrigerator weighing 200 lbs and the average washing machine weighing 150 lbs, carrying them by hand is difficult and dangerous. But with TeamStrap appliance carrying straps you can carry just about any appliance almost effortlessly. Need to move furniture? What about an ultra heavy sofa sleeper weighing in at 400 lbs? No problem for you when you use a TeamStrap furniture carrying strap. TeamStrap contains 2 Harness Straps and an adjustable lifting strap with your purchase. The TeamStrap moving strap makes carrying large, hard to handle appliances and furniture a breeze to move around corners, up and down stairs, and through tight spaces. Save your back! Let your shoulders & legs carry the weight. "We are in our 50’s and 60’s, so moving appliances on our own is harder than it used to be. We used it to lift the refrigerator high enough to kick a dolly under it and then used it to move the stove out of the kitchen for a remodel. Not certain I would try anything as heavy as the strap would hold, but this solved the problem of two people of uneven height and strength moving the occasional heavy and bulky object." Slide the lifting strap underneath the object you are moving. Both people take a shoulder strap and slide an arm through one of the ends. Bend down and thread the other end of the shoulder strap through one eye of the lifting strap. Slide your other arm through that end of the shoulder strap. At the same time as your partner, slowly lift the object by straightening your legs, balancing the object with your hands. 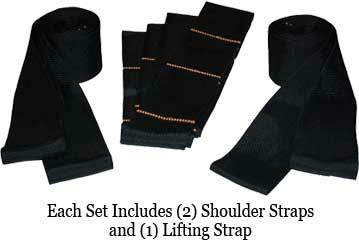 "I am a total weakling with a bad back and the TeamStrap made my move a breeze. The boy I hired to help was absolutely amazed. Let’s put it this way; the $20 saved me hundreds. I only needed one helper and didn’t have to go to the chiropractor! I love it when a product delivers on its promise. Thanks TeamStrap!" © Copyright 2004 - Teamstrap. All Rights Reserved.